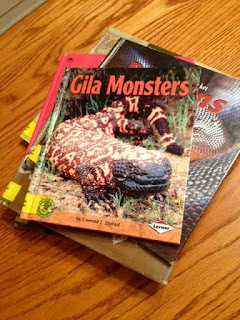 "'... and you can protect yourself from the Gila monster's nasty bite by watching them from a safe distance.' That's the end." "Mom, now that you read me that book on Gila monsters, can we read something else?" "Sure. What do you have in mind?" "How about this one on Kimodo dragons?" "Why don't we mix it up a little?" I'd feel better reading that book if I got the hoe out of the garage first - just so I can keep it here next to the sofa.